Norway is a spectacularly green and sparsely populated country (the second least populated in all of Europe) with about 5 million folks living here -- roughly the same as the Greater Boston Metropolitan area. "Born in the U.S.A." blares out of the speakers of the local Egon Restaurant right on Bergen's Harbor. Tonight Bruce Springsteen (of my home state of New Jersey) is playing a big outdoor concert here and the city is abuzz with not only summer tourist masses, but Norwegian Boss fans as well. The sounds wafting through the city kind of give me a neat "at-home" feeling and a fleeting deeper connection with the country. 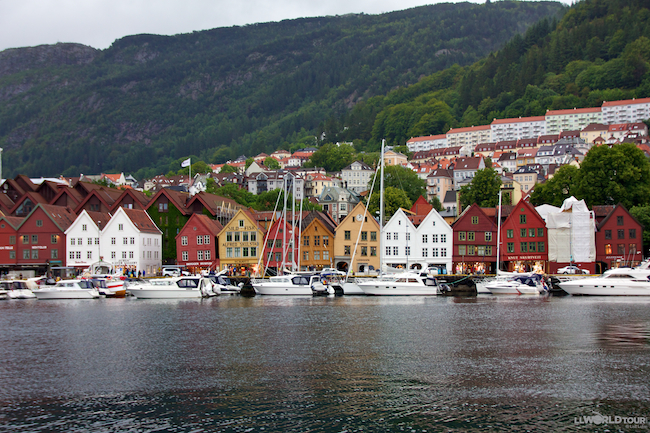 "Bergen is the second largest city in Norway, yet it's retained its charm and character. I feel privileged to live here," says Sue Lindelid, my tour guide and a British transplant who's lived in Bergen most of her adult life. The city of just more than 250,000 people was the first Norwegian capital in the early Middle Ages when this was a popular trading port. Bergen's first buildings were erected along the old Hanseatic wharf, Bryggen, which has been a very important part of the city through the centuries. This UNESCO World Heritage site is made up of the restored colorful, old, wooden harbor buildings and is one of the best known medieval city settlements in Norway. We take a walk through the new indoor fish market. "These fish are rock hard," Sue says about the popular dried codfish. "You could beat a man to death with it." A very peaceful country, I am guessing this is probably just a figure of speech. Maybe Sue keeps a dried cod fish under her bed for protection. I'd think the smell would be prohibitive though. I enjoy some wonderful fresh and exorbitantly expensive salmon -- Norway is NOT a cheap country -- at the more lively outdoor fish market full of mongers selling tasty morsels of smoked mackerel, herring, salmon, caviar and the ever-popular reindeer sausage. I spend the first few days traipsing around town toting my umbrella and donning my rain jacket. Not surprising for Norway's wettest city, one with about 235 days of rainfall each year. On my third day, the sun finally spilled its rays on Bergen's Harbor and seven mountains. While the sun peaked out, so did the people -- not only all the tourists from the big cruise ships (about 260 ships dock here each year) but also the locals who relish a sunny day since they are few and far in between. I ride the popular funicular up the mountainside and am rewarded with a spectacular view of the harbor lined with wood-clad houses, hills and islands all around. The smell of pine needles from the forest fills my nostrils and of course, to cap it all off, Springsteen's sound check is well under way -- reverberating off the hillsides with rock anthem sounds making me feel once again, like home. So it's not really the cities that are the draw here. It's the majestic fjords and snow capped peaks in the country's interior that shine. Fjords are basically deep-cut, sea-drenched valleys that were gouged by massive glaciers roughly two million years ago. Masses of tourists come here for the famous "Norway in a Nutshell" tours. You can take a confusing amount of different routes and tours by ferry, bus, and train. I combined a bit of what's called Norway in a Nutshell and Hardangerfjord in a Nutshell. I highly recommend taking your time as you venture across the country from Bergen to Oslo and not to do it all in one whirlwind day. 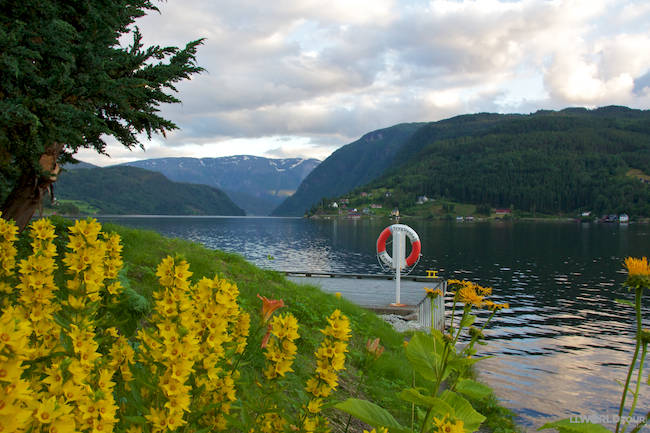 Do yourself a favor and take your time and stay in some of the lovely fjord towns overnight. The tour boats head out leaving you in a peaceful and idyllic setting to relax and enjoy. This tiny town at the end of the Hardangerfjord is one of the most idyllic I've ever seen, pastoral and majestic at the same time. A stay at the Brakanes Hotel is like a slice of Dirty Dancing complete with the white washed, old-timey resort feel and a gorgeous "backyard" which sits right on the water's edge. Not only is this town a great jumping off point for hikes, glacier treks, cycling and fjord adventures, it has a one-of-a-kind new cider route which takes you to the fields and tasting rooms of three fruit farms. Hardanger Cider and Syse Gard's Syse small family cider farm has been in the family for several generations. Out of their cute shop you can buy homemade apple juice (seriously the best I've ever tasted, like drinking a real apple), jams and cured and smoked meats. Just down the road, Nils Lekve runs a slightly bigger operation, making his own alcoholic cider and apple brandy. Both offer guided tours and tastings. Flåm is famous for the Flåmsbana or Flåm Railway, which is ranked by National Geographic Traveler as on of Europe's most beautiful train journeys. This 70-year-old railway takes you from town at sea level up into the mountains through 20 different tunnels blasted into the rock until reaching nearly 3,000 feet just one hour and 20 kilometers later. It's a spectacular journey on the steepest railway in the world. Even better? You can easily bring a bike on board -- they hold them all in a special car -- and when you get to the top, you can cycle all the way down. I hop off just past the steepest part and am able to stop and enjoy the incredible views of snow covered peaks, deep gorges and dozens of mighty waterfalls cascading off the mountainside- I've never seen so many in all my life. The history of the train is covered in the free Railway Museum right at the train station. Check it out to see how this marvel was carved into the mountainside. 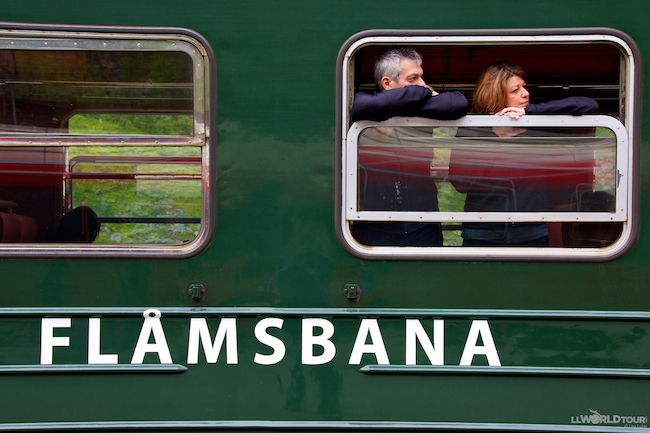 Flåm sits at the edge of the Sognefjord, the world's deepest and second longest. This year round destination has tons of outdoor activities including hiking, biking and kayaking. "I love sea kayaking because it's peaceful and you can see things from a perspective you don't get while walking or driving," says Noora, my kayaking guide for the afternoon. Njord Kayaks is owned by a Norwegian and run by an American. I take their three-hour tour of the fjord area around Flåm while learning some little legends and factoids. Next time you are in Flåm make sure the spirit of Huldra, a seductive woman of the forest, doesn't put you under her spell. After a few ferries, busses and a train, I finally arrive on in Oslo. Often ranked one of the world's most expensive cities, this is Norway's hub for banking, trade and shipping. This green city of about 600,000 is clean, green and very easy to get around. I spend my last few days in Norway exploring the city by bike, foot and tram. For a perfect afternoon bike ride, I cruise around to the peninsula of Bygdøy, a huge green area punctuated by museums and surrounded by the sea, making it one of the most expensive neighborhoods. A visit to Oslo should include the moving Nobel Peace Center, the easy-to-explore National Museum and the whimsical sculpture park of Vigeland. If you can, score reservations at Sanguine inside the stunning waterfront Opera house while the Opera is in session and consider it a great finale to a wonderful trip across Norway.